Eating and Drinking Briefly in New Orleans. So many of the houses are stately and beautiful. Breakfast at Coulis - there is no website, but here is a quick article about the place. Finer than a diner but totally casual, this is a great place to eat breakfast. Cream cheese stuffed French toast with pralines and biscuits and sausage gravy for those of us who care not about calories, and there's yogurt and granola for the rest of you. The coffee is good, the room is sunny and cheerful, and everyone is very friendly. Dinner at The Delachaise - This place is a bar, but it is a comfortable and mature enough place to have dinner. There are at least 30 wines by the glass and some of them are very good wines. I drank 2009 Ameztoi Txakolina by the glass, which at $7 by the glass, I felt great about. So great that although I wasn't planning on it, I ordered dinner, a green salad and a grass-fed strip steak from a farm not too far away (Arkansas, I think). High quality and delicious all around, although the 2007 Trenel Fleurie I drank with the steak was not very interesting or snappy. This is a great casual spot for a a glass or two and dinner, and I would unhesitatingly go back. Cork and Bottle Wines/Clever Wine Bar - The retail store seemed good enough. But the thing that got me about this place is the fact that I could buy a bottle of NV Diebolt-Vallois Blanc de Blancs off the shelf ($46), and walk through an archway to the aptly named Clever Wine Bar, and drink that very wine at no extra charge. No, I am not kidding. I did this at 5:30 pm on a Wednesday, and had I done it later in the evening, there would have been a corkage fee. But even if that fee was $10 or $15, that's still a pretty cheap way to enjoy Champagne of that caliber at a wine bar. Dinner at Pascale's Manale - the woman behind the register at Coulis recommended this place to me when I asked where I should go for dinner to eat something special from New Orleans. "BBQ shrimp at Pascale's," she said. The walk was lovely, the restaurant was absolutely old school and would have been at home in New Haven or Arthur Avenue in the Bronx. But I thought that the food and drink was a bit simple, as if they decided that it is better to offend no one than to thrill anyone. My seafood gumbo was fine, but not really seasoned in any way. And those BBQ shrimp - they certainly were fresh and high quality shrimp. But they sat in a shockingly deep pool of butter. Butter, a bit of pepper and Tabasco, that's it. This is well executed food, but unimaginative and under seasoned. It made me think of someplace that my grandparents and their friends in Florida would flock to at around 4:45 each evening, if I had grandparents in Florida. Even my Sazerac cocktail was too syrupy and sweet. Dinner at Cochon - The culinary highlight of the trip. This restaurant is as good as everyone said it would be - it exceeded all of my expectations. The space is warm and inviting. Cocktails were excellent. We ate a lot, and honestly everything was delicious. Well, I didn't love the fried Boudin, but that's it, everything else was excellent. Fried alligator with Tabasco aioli was great (and I believe one should never pass up the opportunity to eat an animal that if given the chance, would happily eat you). Smokey pork ribs with pickled watermelon, cornmeal dusted ham hock with black eyed peas and limas, cochon (like pulled pork) with cracklins, rabbit with greens and cornmeal dumplings, sides of smothered lima beans and okra...all of these things really delivered. Thankfully I went with people so I could sample all of these different things. I'm going back in a few weeks and my goal is to make friends with the po' boy. Perhaps even the Muffalleta. 2004 Burgundy Red Wine - How Bad is it? It is commonly said that 2004 is the worst recent vintage for red wine in Burgundy. The weather was not good - lots of rain and a lot of rot. But that in itself is probably not the biggest problem with the 2004's. As Bill Nanson of Burgundy Report first wrote about, ladybugs were all over the vineyards in 2004. I heard that they were released to combat some or other aphid, but I cannot substantiate that claim. In any case, when ladybugs are trying to attract a mate or are under duress, they release a chemical of a class called methoxy-pyrazines. This chemical can cause off aromas in wine that are often described as green. But not in the unripe sense, in otherwise ripe wines, it is a vegetal, raw cedar, seaweedy, unpleasant aroma and taste. Anyway, the ladybugs, and if not the bugs then the chemicals they released, ended up mixed in with the grapes as they fermented. Not in every wine, obviously, but in some - perhaps as many as 30% of total red wines were affected. I bought some 2004 wines. I was feeling rather pessimistic about their potential until a few months ago when Peter Wasserman told me that the wines are improving, losing the smell. I decided that I wanted to explore the 2004's - are they really as bad as they're supposed to be? So I got together with a group of Burgundy loving friends who all dug deeply into their cellars and we drank a load of wine - top producers, from villages to Grand Cru. Jean-Marc Morey Beaune 1er Cru Grèves. François Gaunoux Pommard 1er Cru Rugiens. Fourrier Gevrey-Chambertin 1er Cru Cherbaudes. Sylvie Esmonin Gevrey-Chambertin Vieille Vignes. Robert Chevillon Nuits St. Georges 1er Cru Les Chaignots. Mugneret-Gibourg Nuits St. Georges 1er Cru Les Chaignots. Sylvain Cathiard Nuits St. Georges 1er Cru Aux Murgers. Robert Chevillon Nuits St. Georges 1er Cru Les Pruliers. Robert Chevillon Nuits St. Georges 1er Cru Les Saint-Georges. Hudelot-Noëllat Vosne-Romanée 1er Cru Les Beaumonts. Hudelot-Noëllat Vosne-Romanée 1er Cru Les Suchots. Hudelot-Noëllat Vosne-Romanée Grand Cru Romanée St. Vivant. Jean Tardy Echezeaux Vieille Vignes. I have no tasting notes to share with you because I didn't take any, but you can read Keith Levenberg's notes here. I want to share some thoughts, though. People generally agreed that the wines showed better than expected. There were a few that I would call excellent wines, wines that lived up to their potential in a difficult vintage. At the same time, people said that they wouldn't run to the stores to buy them. There were some delicious wines that seemed to me to be in perfect place for drinking. The Fourrier Gevrey-Chambertin, for example - I thought it was great. I liked its clarity and purity, its clean and very pretty fruit. I thought it showcased Fourrier's sheer and elegant style. I also thought Morey's Beaune Grèves was in a good spot for immediate drinking. And although the oak was more prominent than I might like, I thought that Mugnier's Chambolle was a lovely wine. And the thing is, some of the others at the table experienced those wines completely differently. I didn't hear anything negative about the Fourrier wine, but I did hear some say that the Beaune was too oaky, and that the Mugnier wine was clunky, that they preferred the Barthod Chambolle. Hmmm, I found the Barthod wine to be essentially undrinkable. The roasted seaweed and vegetal aromas were just too much for me. But others liked the wine, and I love the fact that this whole thing is complicated enough so that a group of people sharing the same bottles could have such a diverse take on them. Some of the wines showed the off aromas and flavors that 2004 is accused of. I found the Barthod Chambolle to be the greatest offender, but the two Chaignots and Hudelot-Noëllat's Beaumonts also showed green to me. I thought the Pommard was affected too, but others disagreed, saying that it was just the odd expression of minerality in a good young Pommard Rugiens. I was not convinced. Until I drank the leftovers on day three and the wine was absolutely lovely - crushed stones and flowers, with no traces of green. There may have been others that were affected and I missed them - not everyone agreed with me when I thought a wine smelled or tasted green. Some of the wines greatly improved over the course of a few days, shedding bulk, gaining definition. For example, I wasn't moved by Sylvie Esmonin's Gevrey Chambertin during our dinner. I found it to be a big wine that didn't show much other than ripe fruit. But on day three it was far more articulate, showing intensity and detail, and a lovely earthy finish. The wines that initially showed green aromas and flavors, however, did not lose those aromas and flavors over the course of several days. Perhaps the 2004 green wines will not lose the green? The group seemed to agree that 2004 is a vintage in which the quality of the wines very closely adheres to the relative nobility of terroir. For example, as good as the Fourrier villages wine was, its 1er Cru counterpart showed that much more nuance and distinction. I thought this wine was just excellent, and if I owned any I would cellar it for another 8 years or so, the way I would any good 1er Cru from a good producer. Similarly, Chevillon's 1er Cru Pruliers was good. But Les Saint-Georges was a great wine, a wine that in my opinion was everything Les Saint-Georges is supposed to be - full of ripe and rich dark fruit, perfectly structured and balanced, and with lots of depth and complexity that is just beginning to hint at itself at this early stage in its life. Hudelot-Noëllat's 1er Cru Suchots was good, especially on days two and three, but the Grand Cru was a very big step up. I thought that it, along with Les Saint-Georges, were the two finest wines on the table. So, 2004 Burgundy Red Wine - How Bad is it? At this point I would say this: not as bad as you might think. Focus on the wines from the best terroirs. Give the wines time to develop like you would in a typical vintage. And if you have a wine that was affected by the greenies, it might be a simple case of bad luck - doesn't seem like the green aromas are going anywhere, not any time soon, at least. 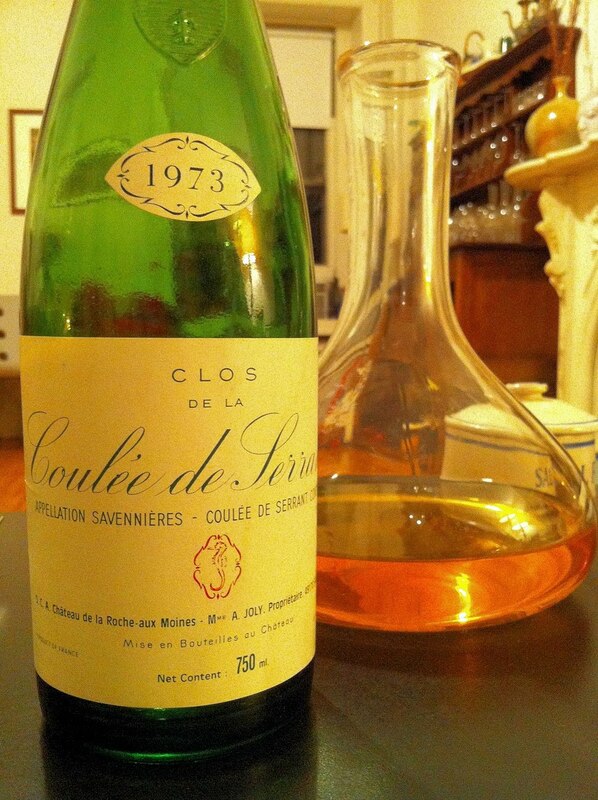 To celebrate a good friend's birthday, the other night we shared a bottle of wine from his birth year, the 1973 Château de la Roche-aux-Moines Clos de la Coulée de Serrant. This wine was made by Nicolas Joly's mother Denise - for a succinct history of the vineyard take a look at the Wine Doctor's profile. We decanted this wine and drank it slowly over the course of the evening. A wine like this provides pleasure on many levels. There are obviously the sensory pleasures of smelling and drinking the wine, but there is perhaps even greater pleasure in doing so in the company of another person, particularly one who knows and loves wine as much as Peter does. The wines of Nicholas Joly are quite controversial and I have absolutely no desire to engage in that debate. I've had very good bottles, and not so good bottles, and I've not had enough examples of Coulée de Serrant to say anything. Drinking this particular wine provoked some interesting conversation (I was part of it, so grain of salt necessary) and I want to share some of the issues we discussed. --This isn't a Nicolas Joly wine. It was not made using biodynamic farming principles, and I have no idea what Denise Joly did in her cellars. Peter suspects, actually, that this wine is was made under what were standard practices - pesticides galore in the vineyards, who knows what in the cellars. --Coulée de Serrant is one of France's and the world's greatest terroirs. It is the apex of Savennières, and some would say, of the potential of the Chenin Blanc grape (although many Huet lovers would argue for Vouvray). --The wines of Savennières and of Coulée de Serrant are made differently now. The wine we drank does not list the alcohol level on the label - that law wasn't yet in existence. But it felt to us that it was 12%, maybe 12.5%. Joly's wines from the same terroir are higher in alcohol now, and I do not know of a Savennières producer whose wines are routinely under 14% in alcohol. --Is it a drive for phenological ripeness in Savennières that fueled this uptick in alcohol? Is it the changing climate? Even Damien Laureau, currently my favorite producer in Savennières, who in fact has a plot of vines that are adjacent to the Coulée de Serrant, his wines are 14%. Is this a stylistic preference or a climatic necessity? 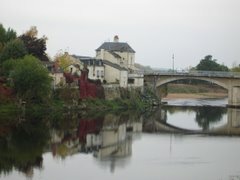 --What happened to quality in Savennières? That is a rhetorical question. As recently as 5 years ago I loved wines made by Closel and others. I've had nothing other than Laureau's wines in recent years that I like. And as good as Laureau's wines are, they require more thought than other wines regarding pairing with food. Why have the great wines of Savennières become not as great? --Will these higher alcohol wines be as long lived as the leaner wines from the '70s and '80s? --The wine we drank was amazing, one of the greatest white wines that I have ever had. It was a distilled rendition of the rocks and soil of Coulée de Serrant. It had nothing whatsoever to do with fruit - there could not have been any less fruit in this wine. 0% fruit. It was pure mineral with amazing intensity and focus, driving throughout and after the finish. And with nothing extraneous, only the vital components present - lean and muscular. Shocking to me too was the vibrancy - this wine is 37 years old and it had great energy and vitality. --I wish I could have tasted it when it was young to understand its progression. Will any of the Savennières I have sleeping in my cellar become wine like this in 30 years? I don't know, obviously, but I would say that sadly, it is not likely. Beat the Summer Heat with Cornas! You know that I'm joking. If I were to list 25 wines that I want to drink in hot weather, I cannot imagine that Cornas would appear. Who wants to drink rustic and earthy northern Rhône Syrah when it's very humid and 94 degrees outside? But the other night I had dinner with a good friend who is somewhat of a short rib master. I wanted to show off a new short rib recipe I've been working on, and so that's what we ate. Heat and humidity be damned. Salt and pepper the short ribs a day or two before cooking. Brown them well over high heat on all sides in a heavy bottomed pot. Remove the ribs, pour out the fat from the pot, lower the heat to medium, and add some oil. When it is hot, add chopped onions and a clove of lightly crushed garlic and stir, scraping up the brown bits from the bottom of the pot. Add salt here, and then a 28 oz. can of tomatoes - I like to use whole plum tomatoes and crush them with my hands. Add some chicken stock, about 2 cups let's say, stir well, and then add two chopped Chipotle peppers. I used La Morena brand peppers in adobo sauce. The peppers aren't very big, so you might be thinking "Wow, only two peppers for all of those ribs and sauce?" I want the smokey spicy Chipotle aromas and flavors to be present, not to dominate, and you're going to braise this for a long time. I put a tight lid on the pot it in a 225 degree oven at about 9 at night and don't take it out until the kids wake up at 6 AM. This dish is good no matter what, but there aren't many ingredients. If you use really good tomatoes and home made stock, it makes a big difference. After the braising is done I remove the ribs and pour the fat off the top of the cooking liquid and purée it. Now comes the creative part. You can shred the meat and serve it with the sauce over pasta or use it as part of a taco. But these are short ribs, after all, so I do the shredding with the leftovers. I like to serve them as is, over the sauce, which I like to reheat with a little bit of cream to make it feel more luxurious, topped with a scattering of cilantro and scallions. If you eat a small portion, it works even in the heat of summer. But what to drink with this dish? Probably beer, but I'm stubborn and we wanted wine. I remembered my friend Peter telling me a little while ago that Syrah is very flexible and can work with dishes like this. So Adam dug around in his cellar and produced a fantastic bottle of wine, the 1997 Auguste Clape Cornas. This is totally unlike the 2000 I had not too long ago, which was delicious and compelling, but much more rustic. The 1997 Clape is without question the most elegant Cornas that I've had. Intense with black olives and earth, but focused and narrow on the nose. And perfectly balanced on the palate, great intensity of flavor, but nothing juts out, not remotely clunky. Very elegant, pretty wine. It worked very well with the smokey spicy meat, assertive enough to hold its own, but graceful too. A completely lovely and delicious Cornas. And somehow it felt like good summer eating and drinking. I recently did some of my best cooking of the year. It's tomato season here. I started with a few Maxwell's Farm heirloom tomatoes. Beginning at 12 o'clock and moving clockwise, that's a Brandywine, a Purple Cherokee, and a Green Cherokee. The Brandywine is the sweetest of the three, the Purple Cherokee the most deeply tomato-ey, and the Green Cherokee the brightest and most acidic, and my personal favorite. This is a recipe that you definitely can do yourself - do not be intimidated by what you're about to see. It's a lot of work, but the end result is worth it. 1) Select ripe but not mushy tomatoes that appeal to your eye. 2) Store them on the counter - never in the refrigerator. 3) Slice the tomatoes and if you wish, sprinkle them with salt. 4) Using a knife and fork, and perhaps a piece of bread, eat the tomatoes. The problem, I think, is figuring out what to drink with this lovely summer treat. I have arrived at only one pairing that really makes me happy - I need more options. So please, you be the sommelier - what would you open with a plate of heirloom tomatoes? I've been thinking a little bit about birth year wines lately. I'm going to be 40 years old not too long from now (absurd, as I still like to think of myself as a 27 year old) and I hope to find a special bottle from 1971 to share with friends on my birthday. 1971 was a good vintage in Burgundy and also in Piedmonte, so it shouldn't be too hard to find something interesting and delicious. What do you do, though, if your birth year was a bad vintage? It's fun to drink birth year wine, and I think it's worth trying to find something anyway. But it's not so easy to find a bottle of wine that's in good condition after 35 years, even from a good vintage. An off vintage makes it that much more challenging to find something delicious and expressive, not merely a wine with the correct vintage number on the label. A good friend had a birthday recently, and later this month he will very generously share a bottle of wine from his birth year with me. His birth year is 1973, not a great vintage in most places. But he knows enough about wine so that his search was very specifically directed, and he found something from the Loire Valley that should be fantastic - I'll let you know how it goes in a few weeks. Domaine Jean et Gilles Lafouge Auxey-Duresses 1er Cru La Chapelle, $27, Imported by Fruit of the Vines. BrooklynLady and I visited the Lafouges in 2006 when she was 7 months pregnant with our daughter. Okay, it's not Roumier or Lafarge, but I'd say that it's more meaningful. The daughter was there in the Lafouge cellars, inside her mommy's belly, when her mommy tasted this very wine (and spat, thank you very much). Middling vintages can sometimes be surprising, by the way. I recently had a 1995 La Chapelle and it was fantastic. Domaine Michel Lafarge Volnay 1er Cru Clos des Chênes, $120, Becky Wasserman Selections. For our 1st anniversary dinner, BrooklynLady came home with a bottle of 2001 Lafarge Volnay. So this producer is meaningful too. And it's Lafarge Clos des Chênes, it should be darn good when she's old enough to drink it. Domaine Huët Vouvray Sec Clos du Bourg, $29, Robert Chadderdon Imports. BrooklynLady and I love Loire Valley white wines, particularly Huët - who doesn't? This one should be great when she gets home from her prom. Gilbert Picq Chablis 1er Cru Vogros, $29, Polaner Imports. I love Picq's wines, I think they were great in 2007, and Vogros is their old vines 1er Cru that ages very well. I have high hopes for this one. I would have saved something by Paul Pernot, who we also visited on that same trip, but his wines weren't supposed to be so great in 2007. Domaine Huët Vouvray Sec Clos du Bourg, $29, Robert Chadderdon Imports. There is going to be some overlap here. Younger daughter gets Huët Clos de Bourg too. And she could do a whole lot worse. I was in Burgundy when BrooklynLady was pregnant with our second daughter, but I didn't go back to Lafouge. I visited Dujac, Roumier, Mugnier, Pierre Morey, Arlot, Rousseau, Pacalet, Le Moine, and Des Croix. 2nd daughter will definitely get something interesting from one or more of these producers. Have I missed something? Was 2007 or 2008 fantastic somewhere and I should save the wine? What do you think about all of this birth year wine stuff. Please, share your thoughts. The other night a friend and I unexpectedly wound up at Lupa for a light late night dinner. We ordered a few little things to start, Romano beans with ricotta (good), house cured tongue (ridiculously delicious), and clams with Fregola and basil. We then had the best Spaghetti alla Carbonara that I've ever eaten. A cloud of earthy pungency from the guanciale in every bite. As good as everything was, it was the Fregola that I was thinking about the next day, a dish that had great potential but, if I may say so, was not perfectly executed. At Lupa the clams are very salty, I would say too salty. And the Fregola are perhaps cooked too long - they offer no resistance when chewed. Or perhaps they are using a brand that doesn't toast the pasta long enough, as they didn't have that nutty taste that I like. It didn't matter much because the dish tasted great - salty clams, Fregola, and the surprising lift of fresh basil. I decided that I had to try to make the dish at home. I started with some Maxwell's Farm basil - very pungent. I salted and boiled a pot of water and cooked the Fregola for about 20 minutes, not longer. I like them to be just a little bit chewy. I scrubbed a dozen Blue Moon clams and cooked them in a covered heavy-bottomed pot with butter, lemon, and a glug of white wine. I took the clams out of their shells and saved them and their cooking liquid. I have no idea how they prepare the dish at Lupa. Onions? garlic? Neither? I decided that I wanted a little garlic and crushed red pepper as the flavor base. There was no red pepper in Lupa's version, but I wanted it. You got a problem with that? Then I added the cooked Fregola and spoonful of their cooking liquid, then the clams and their cooking liquid, and simmered for a few minutes on very low heat, to try to marry the flavors and extract any remaining starch from the Fregola to get a little sauce. At the last moment I added the chopped basil and tossed the dish. It was really quite good, and because my wife doesn't like clams, I got to eat the whole thing. One thing - the basil was not as lively and pungent in my version and I don't understand why. Should I have added it earlier and simmered it a bit? What to drink with this dish? At Lupa, I was charged with selecting a wine and I tried to get something that would go with everything we ordered. I chose what I hoped would be a light and snappy red wine reminiscent of a Beaujolais, the 2007 Luigi Giusti Lacrima di Morro D'Alba, a wine from the Marche. It was fine, but not so great with the Fregola dish. At home I wanted a white, something saline and brisk. I chose a Spanish wine (sorry MicheleColline, but I am not currently in possession of a bottle of Italian white wine), the 2009 Ameztoi Getariako Txakolina, $20, De Maison Selections. This is made from the Hondarrabi Zuri grape, from very old vines - maybe 80 years old. It is only 10.5% alcohol, and it is dry as a bone. 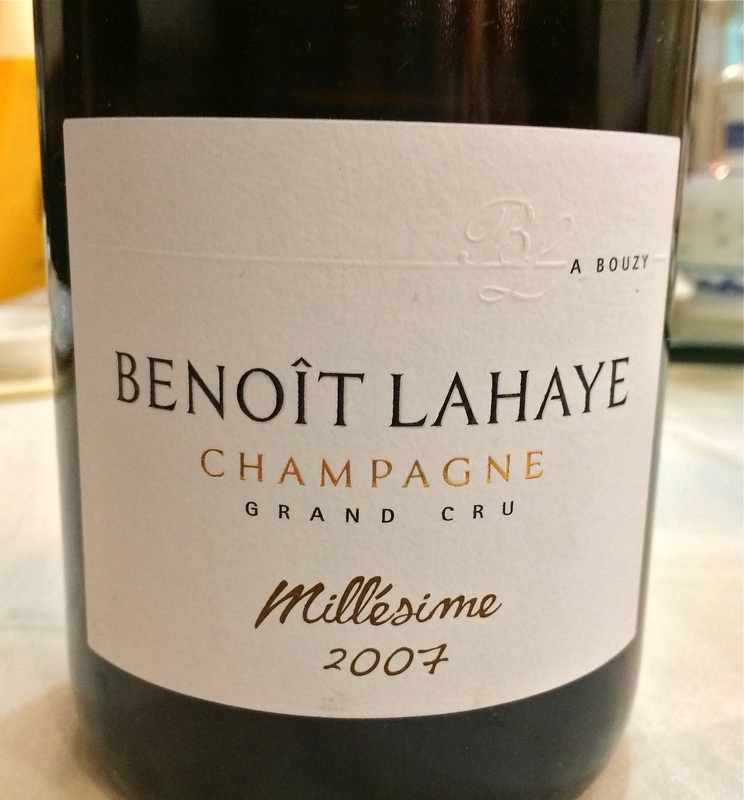 There is a little effervescence and the wine is crisp, salty, and absolutely refreshing. And if you step back and stop gulping it, which isn't easy to do, the old vine intensity and depth are unmistakable. It was a great match for the Fregola. The only problem was that although I got to eat all of the Fregola, BrooklynLady does in fact like this wine, so I had to share. I assure you that I will come up with some sort of scheme to avoid that in the future. Just a couple more notes on new vintages of wines that I drink every year. This is my first taste of 2009 Beaujolais so I don't know if some other examples are bearing out people's speculation that the vintage may be marked by fat, overdone fruit. That is emphatically not the case here. Steve Martin had a memorable line in his novella Shopgirl: "When you work in the glove department at Neiman's, you are selling things that nobody buys anymore. These gloves aren't like the hard-working ones sold by L.L. Bean; these are so fine that a lady wearing them can still pick up a straight pin." The 2009 Clos de la Roilette Cuvee Tardive is made out of the same material as those gloves. This is the old-vine cuvée from Coudert and indeed what makes this special is that unique ability of very old vines to deliver intense flavor out of physical material that is so sheer and fine it's practically not even there. This is practically waifish with a refinement that is already very pinot noir-like in the fashion of Burgundies with an Audrey Hepburn figure, but the flavors show gamay's tart wild-berry side seasoned with something I find myself calling "mealy" for lack of a better term, kind of reminiscent of cereal and multigrain, already past the primary. If you've ever wondered what wines available for the taking today have the potential to turn into tomorrow's sought-after collectibles that you'll kick yourself for not picking up when you had the chance, this is a pretty damn good candidate. It's an iconic Beaujolais, costs a whopping $5 more than the basic bottling, and has a production level somewhere around the quantities of Roumier Musigny. Only one of two things can happen. The first possibility is that it remains an insider's wine and the only way to experience a mature bottle will be to cellar it yourself, because the people who have them won't be selling. 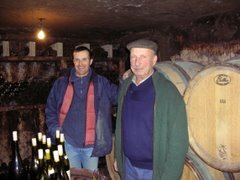 The other possibility is that collectors of top Burgundy realize they ought to have some top Beaujolais in their cellars, with the usual price consequences. Either way I'm glad to have stocked up. 2009 Bernard Baudry Chinon Les Granges, $17, Louis/Dressner Selections. This is Baudry's "entry level" Chinon from gravel soils. The 2009 is not a successful wine, to my taste. It borders on fruit bomb. The fruit is attractive and clean, but the wine doesn't speak to me of the gravel soils where it is grown (the way '08, '07. and '06 did, for example), and it simply is not a very interesting wine. I thought that perhaps I was catching the loud and fruity opening phase, so I left it alone for about 12 hours and very little happened to improve the wine. It's drinkable and the ripe dark fruit is very tasty. But I didn't find balance, acidity, or much beyond the fruit. 2008 Bernard Baudry Chinon Les Grézeaux, $24, Louis/Dressner Selections. From hillside vineyards of clay and gravel right next to the Baudry's house. This wine rests in cement and sometimes in neutral oak, and I'm not sure what the regimen was in 2008. This wine along with the Cuvée Domaine are, to me, the value selections in the Baudry portfolio. They are consistently excellent wines and they're ridiculously inexpensive for what you get. The Cuvée Domaine is about $18 for goodness sake, and it's a great wine (inexplicably the fantastic 2007 is still available and if you haven't had it, you really should). The 2008 Grézeaux is hard to figure out right now. Upon opening it was aromatically lovely with pungent dried flowers and earthy fresh fruit. The palate shows good balance and texture - this wine is lighter than the 09 Les Granges, but there also might be a bit of a hole in the midpalate. I'm just not sure, because it drank better the next day, although the aromas had receded a bit too. Check back in perhaps 5 years and we'll see where this one goes. Business travel finds me in Memphis, Tennessee. I'm going for dinner, on my own, to Bari Ristorante e Enoteca. They have a nice sized all-Italian wine list, including a lot of wines by the glass. I don't know what I'm going to eat, but it's 103 degrees here and it will probably be something on the lighter side. I'm willing to spend$35-$40 on wine. What should I drink at Bari? And by the way, if these wines are representative of what's happening in general, 2009 in Beaujolais really is as awesome as they say. Buy the wines and drink them. Sure, pick a few that you are most interested in and lay a couple of bottles down, but these wines are drinking beautifully right now. Don't miss it. 2009 Marcel Lapierre Morgon, $22, Imported by Kermit Lynch Wine Merchant. Ripe and enticing, pure and clean, very fresh, this is bursting with red fruit and as if to suggest what we would be eating with this wine if we were already in heaven, an undertone of earthy cured meat. This wine is not perfect - I find the alcohol to be a bit awkward, although the bottle says only 13%. But I wouldn't be surprised if it is in fact higher. And in any case, it juts out a little. The this is, the wine is still delicious. I cannot imagine cellaring it, as it tastes so good now, and doesn't seem to be holding anything in reserve. 2009 Coudert Clos de la Roilette Fleurie, $20, Louis/Dressner Selections. Ripe and aromatic, very generous, plushly textured and with good body and richness, but without crossing into the land of overdone or huge. In other words, it's a solid standard deviation away from the ripeness mean, but still within the realm of normal. Will this age well? I don't see why not. There is plenty of acidity and the wine is fundamentally in balance. In this case though, I'm having a really hard time imagining why I would try to hold it. The drinking really is just that good right now. 2009 Clos de Tue-Boeuf Cheverny, $16, Louis/Dressner Selections. Pure joy. Vivid red fruit, when served cool the texture is not entirely smooth and that is a big part of the charm, the acids are strong, the aromatics are lovely, the wine is clean and absolutely well balanced, and the finish lingers longer than it has a right to considering its humble pedigree. You blend Pinot Noir and Gamay somewhere near Touraine and you can make a decent wine. Even if you are Thierry Puzelat, the wine is not always great. This time, it's great. What else can I say - pure joy. 2008 Pierre Gonon St. Joseph, $25, Imported by Fruit of the Vines. As good as this wine is, it's a bit of a disappointment. The past several vintages have been wonderful and this wine is very tasty too, but it isn't as strong as its predecessors and this is clear. It has the dark fruit, the olives, the wet soil, the finesse that I know of Gonon and his plots in St. Joseph, but it is lacking the complexity that I have come to expect and with air, the emptiness of the midpalate really shows. The price is right and this is good drinking, but don't believe that this is the best that Gonon can show you. 2009 Domaine de la Pépière Muscadet Clos des Briords, $16, Louis/Dressner Selections. This drinks differently than any young Briords that I've had, but that's okay because it's still absolutely delicious. This one is far more crowd friendly and approachable. The aromas are lovely and clear - lemon, a bit of yeast, spring water. The wine feels relaxed, as if it's already gone through that young tightly wound period. I've learned enough, however, about this wine to know that based on this one bottle, I have no idea what's really going on here. It certainly seems like it wants to be enjoyed early. And it tastes really good right now. 2008 Albert Boxler Edelzwicker Reserve, $16, Robert Chadderdon Selections. Sometimes the overall bigness and the residual sugar in Boxler's wines makes it hard for me to appreciate them on a practical level. Meaning, I respect what's going on, but I don't always want to open and drink them. Not so with this wine. This is the field blend of essentially every white grape grown by the estate. Yes, it is full bodied and big, unmistakably a Boxler wine, and there is residual sugar too. But the wine is very well balanced and actually feels lean and mineral on the finish. Herbs, pits, wildflowers, and bitter honey support and lend complexity to the wine, and it is so very satisfying. And flexible too - find something that doesn't eat well with this wine in the heat of summer, I dare you. 2000 López de Heredia Rioja Rosado Viña Tondonia Gran Riserva, $24, Imported by Polaner Selections. I haven't actually had an entire bottle of this yet, just glasses on several occasions. But I'm very excited about what I drank. This wine is perhaps more grounded than the 1998, a wine that I think is absolutely excellent, but a wine that took a year after release to show as well as it does now. That's the thing with these Lopez wines - they release them when they think they're ready, but maybe they should get a little more time in your cellar anyway. The 2000 has a darkly spicy, very focused character, and it is more attractive to me early on than the more tropical 1998 at this point in its life. Blood orange, salt, sherry, and so clean and pure. I hope I have the self-control to hold onto a few of these.